This project started life as a “Portrait of a Place” for Graphic Design Overview. The assignment was to create a piece that conveyed the essence of a location, through the use of conceptual development and experimentation with methods of image creation. I choose the location of the Moon and through several ideation processes, including brainstorming and mind mapping, choose the concept of the spacesuit. The original set of cards were a combination of collage and Xerox toner transfers with 3-d elements created in photoshop. I designed a set of 3-d glasses to accompany the cards. 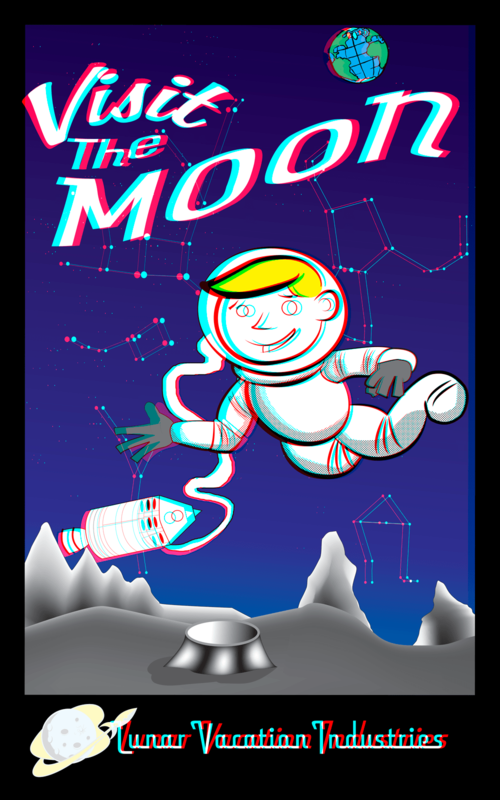 Expanding on this idea, I created a travel poster for the Moon using an expanded concept of the cold war space race. The idea had stayed with me long after Graphic Design Overview. I was inspired by illustration based travel posters and the cartoon character spokesperson from the 1950’s. Several drawings were created, then scanned, and vectorized using illustrator. I further researched the creation of anaglyphic 3d images, learning how to make images recede and protrude from the picture plane. Additional research went into typesetting technologies from the 50’s and 60’s such as film typesetting and linotype and filmotype machines, as well as the types of typefaces used in that era. Filmotype Lakeside was used in the main “Visit the Moon” element. Armstrong Swash was used for the Lunar Vacation Industries word mark. And because you can’t have a 3-D poster without 3-D glasses, a new pair, modeled after the lunar lander, was created as a companion.